I swear that I woke up to a ripped nail a few mornings ago, I literally have no idea how it happened. My nails were ridiculously grown out by my standards and needed doing anyway so it was time for a change! I had no idea what I wanted on them so I looked for inspiration around my home salon and decided that I would work around the African Jade foil that I had sat on my shelf. I wanted to use CND Shellac in Mint Convertible which can be little on the sheer side so I always apply a layer of Studio White underneath for good coverage (also I barely use Studio White) and it works a treat! 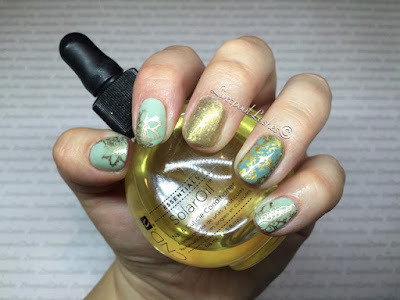 I painted my middle and ring fingers with Locket Love, applying the foil to my ring finger and Lecente Stardust Glitter in Starlight to my middle finger. 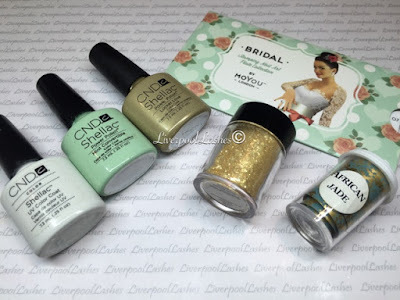 Finally I applied a stamp from MoYou London Bridal Plate 07 to all of the mint nails.